August 11 was my dad’s birthday and the occasion of the most recent post to this blog. Since there has been a long stretch of nothingness here since that last post, I wanted to explain why. 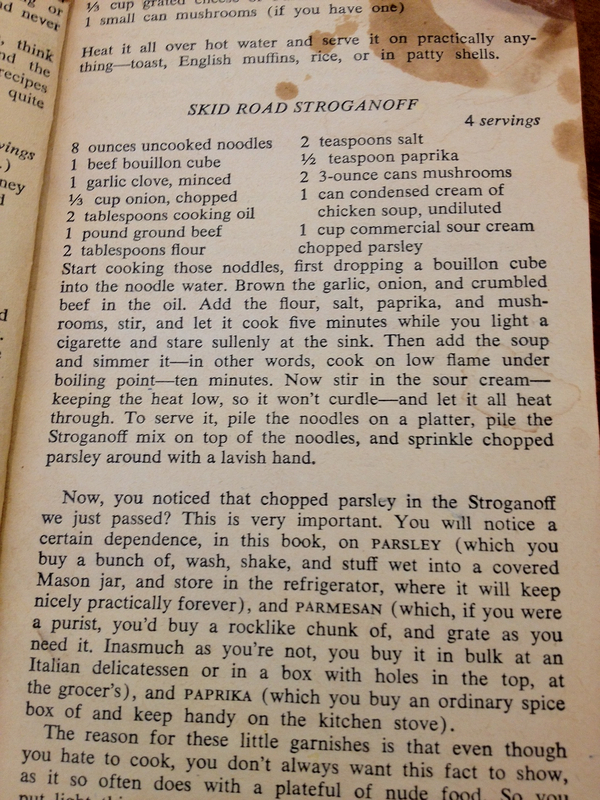 “The I Hate to Cook Book” is an irresistible treasure for so many reasons, its “Skid Road Stroganoff” (recipe below) and sassy commentary not least among them. One of Mom’s favorites. On August 12, I learned I was pregnant. For the next three months, instead of writing, I spent many hours at the doctor’s office, wondering what would happen this time (I’ve not had much success thus far with pregnancy), and fighting serious morning – or as I like to call it, “all day” – sickness. But when I was able to eat again, I had some pretty intense cravings of my own. Taco Bell bean burritos frequently felt like a necessity – like the replenishment of an essential nutrient constantly deficient in my body – but mostly, I’ve wanted classic comfort foods. Macaroni and cheese, meatball sandwiches from the local Italian deli and my husband’s grilled steak. (If any of my doctors are reading this, know that I’ve also worked in a fair number of fruits, vegetables and whole grains, too.) Now that it’s fall, sweet potatoes and yams always sound delicious, and I’ve prepared them mashed and as oven fries, eaten them pureed into seasonal stews from a favorite local food truck, and enjoyed an absolutely lovely version, whipped with chipotle and a touch of lime, and sprinkled with toasted pepitas, from the deli case at Whole Foods. 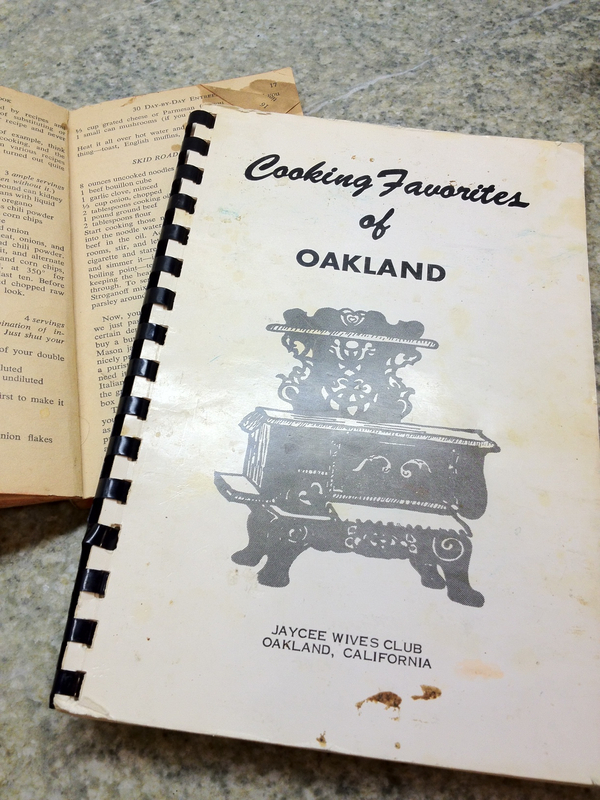 One of my mother’s favorite old spiral-bound cookbooks, “Cooking Favorites of Oakland,” includes a basic recipe for hamburger stroganoff she’s riffed off of over the years. The homiest craving of the bunch, however, has been for my mom’s version of beef stroganoff – hamburger stroganoff, to be specific. It’s a dish that was a staple of my childhood, the kind of no-big-deal weeknight meal that we always loved and tasted just as good, if not better, the next day. I couldn’t find my mom’s recipe the night I needed hamburger stroganoff, so I winged it. What’s most unusual (after looking at traditional and similar 1970s and ‘80s takes online) is her addition of a bit of tomato paste, lending a pink hue and grounding acidity to an otherwise creamy dish. A few chilly nights this past September my husband and I relished this stroganoff, he with a glass of wine or beer, and me with a mocktail, made by him, using as many real-cocktail ingredients as possible – citrus juices, flavored and traditional bitters, tonic water or artisanal soda – to help me feel like I am still a participant in the world of fine dining and interesting beverages. When pondering possible photos for the next post on Iceland, I was reminded of all the lovely drinks I enjoyed on that trip, just a few weeks before I must’ve conceived. Though I miss my daily sip of wine or a good, old-fashioned gin drink, it seems a worthy sacrifice to bring this little one into the world. And when she’s here and able to eat solid foods, Mom’s hamburger stroganoff will definitely be on our family’s dinner menu. Because neither my mother nor I can find her recipe, scrawled on a 3-by-5 index card and used over a period of more than 30 years, she’s offered this for the post – one of her longtime inspirations for the dish, slightly altered to her liking. 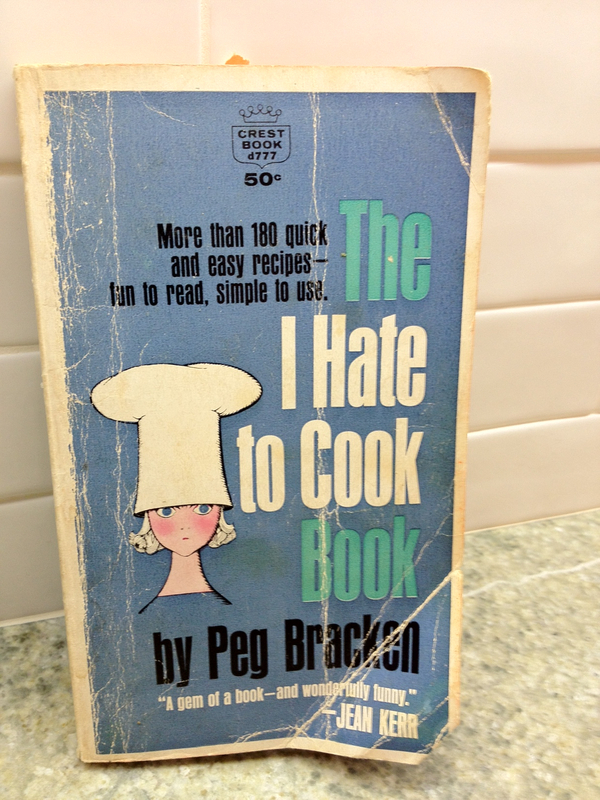 Note: The fabulous copy – other than the ingredient adaptations – was not altered from the 1960 book. Start cooking those noodles, first dropping a bouillon cube into the noodle water. Brown the garlic, onion and crumbled beef in the oil. Ad the flour, salt, paprika, mushrooms *and tomato paste, stir, and let it cook five minutes while you light a cigarette and stare sullenly at the sink. Then add the soup and simmer it – in other words, cook on low flame under boiling point – 10 minutes. Now stir in the sour cream – keeping the heat low, so it won’t curdle – and let it all heat through. To serve it, pile the noodles on a platter, pile the stroganoff mix on top of the noodles, and sprinkle chopped parsley around with a lavish hand. Wait – did you say SHE? Oh, and I love your post and you and am so glad you are eating and blogging again. Yes, it’s a she! And thank you so much for the love. Back at you, Sarah B.
Laura, Think of you so often and SO thrilled for you! Oh, Tara – ditto and thank you so much. Your latest addition looks the picture of contentment.